Currently, the Emerald Buddha and the Temple reside on Grand Palace grounds in Bangkok. The name of the Buddha's home is Wat Phra Kaeo or Wat Phrakaew, known as Temple of the Golden Buddha in English. The official name of the Emerald Buddha is Rattana Satsadaram. The Emerald Buddha was a statue on the move. Historians have found records of the statue in Cambodia and Laos before arriving in Thailand. Even though it is known as the Emerald Buddha, the statue is carved out of exquisite jade, also known as Nephrite. The Buddha, depicted in a meditative pose, is dressed in gold. Its three different garments correspond to the three seasons: the cool season, summer, and the rainy season. The other two outfits, when not adorning the Buddha, are kept in the nearby Pavilion of Regalia, Royal Decorations and Thai Coins, which is also open to the public. Emerald Buddha Temple currently resides on the grounds of Grand Palace, the heart of Bangkok's historic district. The namesake statue, though called the Emerald Buddha, was carved out of a single piece of jade. The word in Thai designates the deep green color of the stone rather than a specific stone. The Buddha sits in a meditative pose. Though small in stature-the Emerald Buddha is 45 centimeters tall, which is about 17.5 inches-it is impossible to look away when standing in its presence. The Buddha wears exquisite clothing, crafted out of genuine gold. A total of three outfits have been crafted for the Buddha, changed with the arrival of a new season. When it's time for a new outfit, the clothing is changed with great ceremony. This important ritual is presided over by the Thai king, who is the high master of Buddhist rites. The king will chant prayers as he changes the crown. His servant will change the garment before the king blesses the faithful and the monks gathered to receiving blessings for the new season. The costumes change three times a year, once for the arrival of summer, once for the rainy season, and once for the cool season. The dates are kept according to the lunar calendar, and arrive around March, July, and finally November. That Emerald Buddha's temple, called Wat Phra Kaeo or Wat Phrakaew in Thai, is one of many buildings on the grounds of the Grand Palace. The temple, topped with green and orange tiles, looks very much like the temple in the old capital of Ayudhya. Today, the architecture is known as the old Bangkok style, or Rattanakosin. Pillars, inlaid with precious materials, stand near marble walkways. The Buddha and the altar are flanked by a pair of images of Buddha, representing the first and second king of the Chakri Dynasty, the current rulers. Intricate paintings, copper-clad walls, and murals also surround the gold-dressed Emerald Buddha. Many visitors include time at the temples while they're exploring Bangkok. They're at once historical sites, cultural destinations, and fascinating-a place of peace in the midst of a world-class city. Other temples, known locally as wats, are open to visitation. Wat Arun Grand Palace is a landmark of the Bangkok landscape. The Buddhist temple stands on the banks of the Chao Phraya River, named for the Hindu god of the sunrise. When the sun does rise, its morning light bathes the temple in a opalescent shimmer. Wat Saket, too, has a long history. It was renovated by Rama I, the first ruler of the Chakri Dynasty. Situated high on a mountain, the temple offers a fine vantage point for admiring the Bangkok skyline. 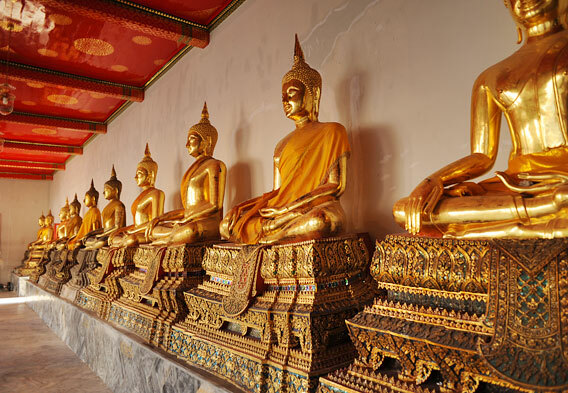 Wat Pho, near the Grand Palace, is another frequently visited Buddhist temple. It's best known, perhaps, for its statue of the reclining Buddha and its lush gardens. The temples and religious sites are just one component of the mufti-faceted world of Bangkok. The city is at once ancient and modern, peaceful and vibrant, mulch-cultural and distinctly Thai. 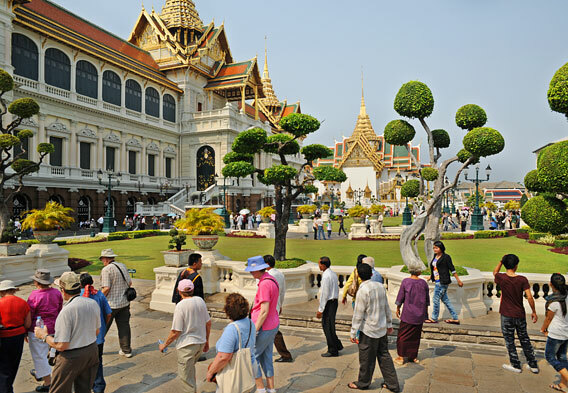 The most populated city in Thailand, and its capital, Bangkok offers much to explore. Its traditional markets draw both locals and visitors who come to shop as well as browse. The Taling Chan Floating Market is a rarity, and the Chatuchak Weekend Market is real exchange of culture. There's also a modern side to Bangkok's shopping scene with its shopping malls and upscale retailers. The city's nightlife scene, too, is modern, especially in places like Patpong and Soi Cowboy in Sukhumvit Road, which are especially popular with ex-pats and international travelers. Besides standing near the top of the list of the world's most visited cities, Bangkok has earned the nickname as the Venice of the East. Its canals, known as klongs, offer a taste of the old city, the one that predates the shopping malls and the skyscrapers. Many of the long-tail boats still ply the waters of the Thonburi River. An attentive driver will drive just slow enough for pictures of the distinctive houses along the banks and temples in the distance. The canals are also used as watery highways, so its not uncommon to see water taxis and commuters on their way to work. As a world-class city, the choices for accommodations are plentiful. Everything from luxury hotels with international brands to locally-owned tiny boutique hotels welcome travelers for overnight stays. The hotels are available for all budget points, whether travelers are looking for an upscale stay or budget Bangkok hotels. The city's finest five-star hotel, Leuba at State Tower, offers stays that are as luxurious as they are stylish. If you don't have the budget for this hotel, you can still enjoy a visit to Sky Bar, the world's highest open-air bar, and enjoy a drink. Pathumwan Princess Hotel (pictured), another hotel with great dining options, is located in the heart of the city. 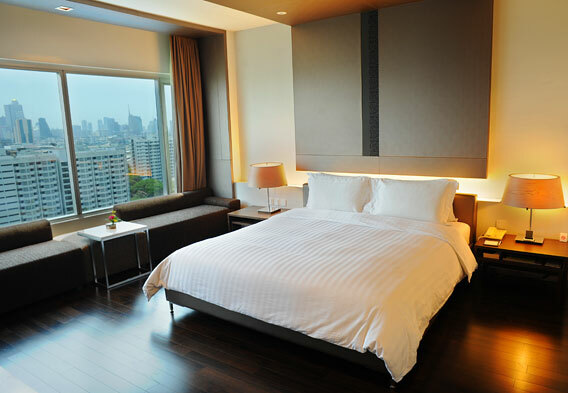 Its pools, spa, and luxury décor make the hotel a top choice for overnights in Bangkok.